Your residential property, home, and even patio furniture reflect your personal style preferences. Likewise, your landscaping choices in your front yard can reflect your unique style and personality (versus those of your neighbors). A simple way to emphasize the individuality of your home and property is by incorporating rock designs into your overall landscaping. The following are ways that you can create a unique front yard landscaping design incorporating different rock placements. Foundational to Frank Lloyd Wright’s residential architectural goals was the incorporation of natural elements in the overall design. (A prime example is the landscaping surrounding his own Taliesin West house in Arizona.) Rocks are an ideal natural design element, in that the need for a fully plant-based or grass lawn can be eliminated. Consider how a painting is conceived by an artist. The artist’s technique for creating the illusion of three-dimensions on a piece of paper is to use wide diagonal lines to create a sense of distance (or perspective). In turn, the diagonal lines incorporated into the drawing––that will eventually become a painting––enable the viewer to imagine the distance between that viewer and a specific object in the drawing (e.g.,a house or mountain). If your front yard is small, incorporating carefully-placed diagonal-line rock designs can create an illusion of more distance between your house and the street in front of it. Likewise, straight-line designs can make a large, tree-less front yard appear smaller. MDI Rock has rocks and pebbles in an array of colors for purchase that can be used for creating such diagonal lines. 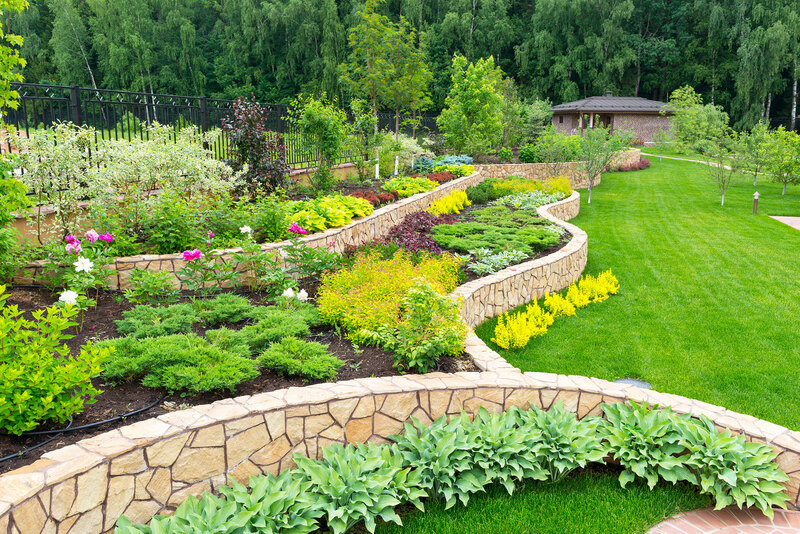 Rock landscaping can also promote the feeling of living near gently-rolling hills––even if the ground surrounding your house is entirely flat. In order to both utilize lines and vary the appearance of the landscape, you will need to envision a series of 45-degree angle geometric parallelograms dug into your front yard (and spaced at least five feet apart from each other). After you (or a landscaper) have dug the holes into the ground, pieces of wood (or flagstone, as available at MDI Rock) can then be used to form the borders of the parallelograms. The next step is that mulch and topsoil (which can be purchased at MDI Rock) needs to be mixed with any existing soil in the holes bordered by the parallelograms. Then, a flowering perennial plant that thrives in Phoenix (such as presented on the Arizona Municipal Water Users Association [MWUA] webpage) can be planted in each hole. Chaparral Sage is recommended because of its eye-catching purple blossoms, and also because it thrives in the Arizona desert. The pinkish-color of MDI Rock’s Screened Yavapai Coral can complement the use of Chaparral Sage, and be placed around each plant to decrease the need for watering (as the rock layer will hold in the moisture in the underlying soil). Alternatively, it can be used to avoid needing to plant (or re-plant) grass on the rest of your front yard. If you prefer a different design appearance, landscape glass (such as sold by MDI Rockin Phoenix, Arizona) can be a good choice using the same parallelogram design.